The Eiffel Excellence Scholarship Program was set up by the French Ministry of Foreign Affairs and International Development (MAEDI). The objective of this program is to enable French higher education institutions to attract top international students from emerging countries for enrolment in the Masters and PhD courses. This scholarship program helps to shape future decision makers in foreign public and private sectors, in priority areas of study. Applications from emerging countries at Master’s level and emerging and industrialized nations at PhD level are encouraged. A Ph.D. component to fund mobility programs for 10 months under a thesis joint supervision or co-tutorship (preferably for the second doctoral year). For PhD courses, a maximum of 10 months is allowed for the entire course. Note: For a student to receive the first installment of the monthly allowance, he or she must have started the course of study at the host establishment in France. 350 grants are awarded annually to Master’s students, and 50 for Doctoral students. For Bi-national candidates, if one of the candidate’s nationalities is French, the applicant is not eligible. For master’s courses, candidates should not be older than 30, and at PhD level, not older than 35, on the date of the selection committee meeting (6th March 2019). Applications must be submitted by French higher educational establishments in order to be accepted. These institutions will then enroll scholarship holders in the course for which they have been selected. 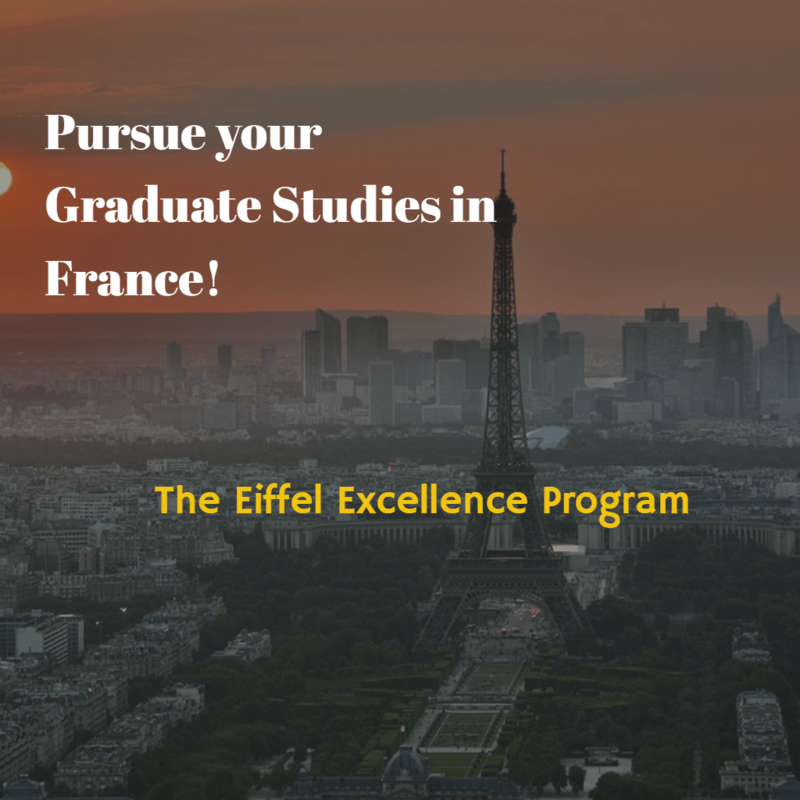 The Eiffel Excellence Scholarships are for students who wish to enroll in Master’s (including engineering) and PhD courses in France. This program does not apply to French-run master’s courses abroad, as students must undertake at least 75% of their course in France. When selecting non-French speaking candidates, French higher education establishments must ensure that their language skills meet the language requirements for the course of study. Any student taking a course of study abroad gets priority over students already living in France. Eiffel Master’s Scholarships – Any scholarship application that was previously rejected will not be accepted, even if it is submitted by a different establishment or is for a different field of study. Also, students who have already received an Eiffel Master’s scholarship cannot re-apply for another award at the same level. Eiffel PhD Scholarships – French higher education establishments may nominate a candidate who has previously received a Master’s scholarship for a PhD scholarship. Candidates can however not get a second PhD scholarship under the Eiffel Excellence Program. Also, any scholarship application that was previously rejected will not be accepted, even if it is submitted by a different establishment or is for a different field of study. Each French higher education establishment selects candidates for the Eiffel Excellence Program from the international students to whom they have offered placement in a study program. The establishments complete and submit the application forms for each candidate online. Each application must fulfill the program criteria and should be complete at the time of submission. Incomplete application forms will be rejected. Each establishment should nominate no more than 40 candidates from each field of study for a master’s scholarship. The list of applications submitted online must be sent to Campus France by 11 January 2019. The selection is done by a committee composed of three groups of experts (one for each field of study). The members of these groups are not allowed to assess applications submitted by institutions to which they are linked institutionally. At this point, the cultural action and cooperation services of the French embassies are consulted, for their opinion on the applications of individuals from their respective countries. Once complete, the list of successful candidates is published on the Campus France website. Applications close on January 11, 2019.